Currently we are only offering the Basic Rider Course due to changes in the Three Wheel Course and Basic Rider Course 2. Please check back or call for further information. This class is the best place for a new rider to start once they’ve made the decision to ride a 3-wheel motorcycle. Three wheel bikes handle very differently from their two wheel counterparts. This course includes four hours of classroom activities and up to eight hours of on-cycle riding exercises. Successful completion may lead to an insurance discount. A person must pass a knowledge and skill test for successful completion. Upon successful completion you’ll receive a course completion card that you’ll take to the DMV so they can add the motorcycle endorsement. 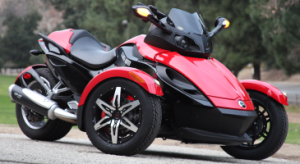 A & J Motorcycle Safety School has a 3-wheel motorcycle (a 2010 Can-Am Spyder) you may use for your class with an additional fee. Please call for details and availability is based on first come first served. If you bring your own bike you must provide proof of insurance, a current inspection sticker as well as proof of registration. 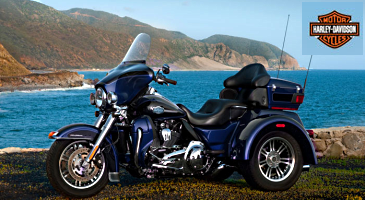 If the bike is on loan to you a letter from the owner with a copy of their registration must accompany the letter giving you permission to use their bike as well as the other items listed above. The bike cannot have any fluid leaks because it will not be allowed on the range. Payment can also be submitted via paypal, a secure method of accepting credit card payments online. Cost is $350.00 and May be paid in 2 installments of $175.00 each with the first being your deposit. Payment can be made over the phone with a credit or debit card, mail a check or at the Paypal link. 3. Turning diameter of the vehicle at its widest point must be less than 40 feet. 4. The vehicle must meet all applicable federal/state on-road vehicle standards. 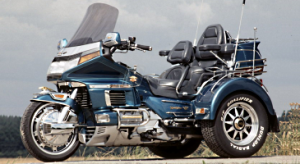 Any other significant departure from the standard motorcycle design. MSF 3-Wheel Basic RiderCourse is a basic, entry-level, learn-to-ride 3-wheel motorcycle training and education course. 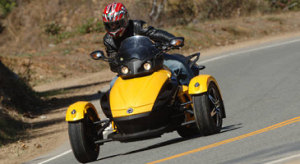 It provides the same fundamental skills as the MSF Basic RiderCourse, but on 3-wheel, 3-track motorcycles (not sidecars). 3-WBRC RiderCoaches who have been trained and certified by the MSF conduct the 3-WBRC. Develop a strategy to manage risk. 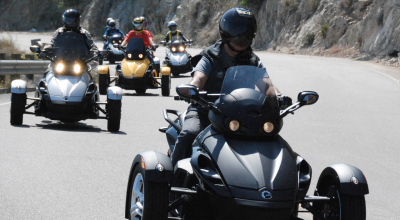 Generally, a person successfully completing the 3-WBRC will be able to demonstrate fundamental skills for general operation and control; demonstrate a knowledge of minimum safety considerations for operating on the street; acknowledge the importance of a low-risk and positive riding attitude; demonstrate safety habits that are shown to reduce risk; acknowledge personal capabilities and limitations as a 3-wheel motorcycle rider; and demonstrate the basic knowledge and skills to be a safe, responsible rider. What does 3-WBRC consist of? Both classroom and hands-on instruction. There are 10 riding exercises with one being a demonstration only that takes about 8 hours (more time may be needed for remedial training and/or breaks), 8 hours of classroom instruction, and a knowledge and skill test. Total instructional time is approximately 16 hours. This will vary depending on class size. A completion card will be issued, and a MSF Student Survey form is included in each 3-Wheel BRC Rider Handbook. Are the requirements for personal protective gear for the 3-WBRC the same as the BRC? Yes. Personal protective gear includes a helmet designed to meet DOT standards, eye protection, full fingered gloves, over-the-ankle footwear, long-sleeved shirt or jacket and long pants (sturdy, jeans for an example). How many participants can be trained in one 3-WBRC? The participant/3-WBRC RiderCoach ratio is 4:1, with 12 participants maximum in a class. If only one RiderCoach is available, the maximum number of students is four; additional time may be needed for the range exercises. What do successful graduates who complete 3-WBRC receive? Besides developing fundamental skills and acquiring the strategy for safe and enjoyable operation for three wheel motorcycles. A student who successfully completes the course will received a course completion card and a Motorcycle Safety Foundation card showing you completed the course. This does act as a waiver for the State of Maine for the knowledge and road test. If you pass the knowledge test but do not pass the skills evaluation then you will receive a course completion card which will be a waiver for the knowledge test but you will have to schedule a road test through the DMV or return to a motorcycle school of your choice to conduct the range portion again (attending a school can only be done within six months of completing the original course and a fee may be required). Please feel free if there are any questions regarding this. Will the 3-WBRC provide a licensing test waiver upon completion? Possibly. While the 3-WBRC was designed to provide a license waiver, the state Department of Motor Vehicles will make the final determination for their state. Successful completion of the 3-WBRC should provide the skills and knowledge needed to obtain a license for the state of Maine. Check with your states DMV for their requirements. A and J Motorcycle Safety School, LLC reserves the right to cancel/reschedule class due to unforeseen circumstances. A and J Motorcycle Safety School course instructors are certified by MSF and licensed by the state of Maine.